Who you gonna call... to ask about the extortionate price? 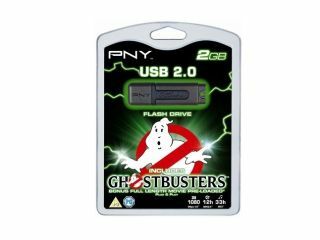 In what marks the first time a full-length movie has been released on a flash drive, PNY has teamed up with Sony Pictures Home Entertainment to distribute the '80s classic film Ghostbusters. The film comes preloaded on to PNY's new range of USB drives. The drive itself, however, bears no markings of the film which would have made it much cooler and a whole lot more collectable. Instead, what you get is a pretty piece of packaging, the film and a USB stick. And how much for this set, we hear you ask? Well, for some bizarre reason, it's retailing on Argos' website for a crazy £29.99. Which for a fairly cheap USB and a film you can find on DVD for under a fiver is pretty steep. For this price we would expect the drive to be hand-delivered by mr Bill Murray. Or, at the very least, the guy that turns into the demon dog in the movie. TechRadar would love to say that you can find the PNY package cheaper elsewhere, but at the moment it is exclusive to Argos.